Newsmag Theme has a font customization theme section where you can set custom, Google, Typekit or standard fonts, font sizes and font line heights. Everything you need to adjust your website fonts, you will find under the Theme Fonts tab! 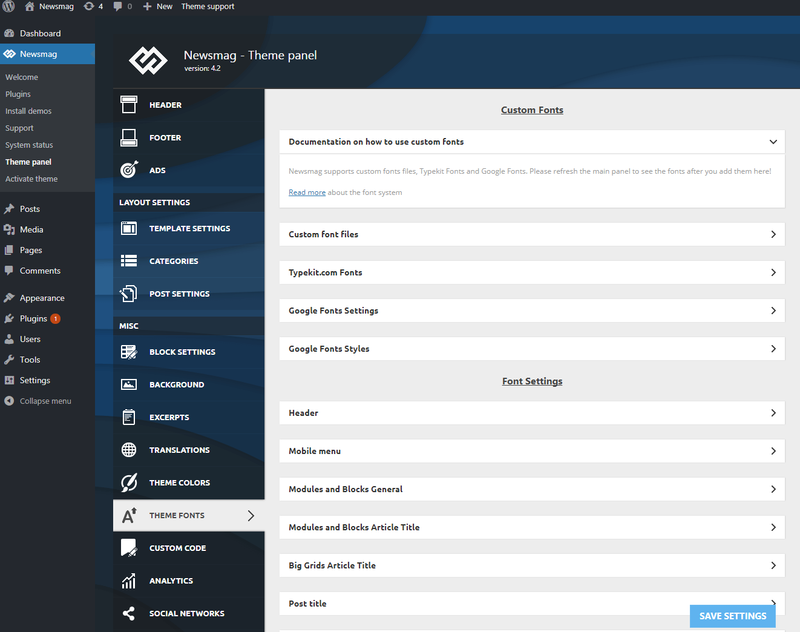 The theme fonts panel section is structured in 12 expandable areas related to the elements you can customize. In each area, you will find a standard font, size, line height, style, and weight loaded by default. All these elements are fully customizable. From here, you can select what character subsets will be loaded for each Google font. The character subset will be loaded only if the font supports the specific glyphs. Try to enable only the subsets that you use, because with each additional subset the site will slow down the loading process.